Soak up some shade under the Tiki umbrella. Aerial View - Emerald Isle facing the Gulf of Mexico with beach side pool. This condo is light, bright and comfortable. The décor is stylish, the kitchen well equipped, the bedrooms are dreamy and each has a flat screen TV on the wall. The private balcony faces the beach and the Gulf of Mexico. From there you can enjoy our beautiful sunsets! 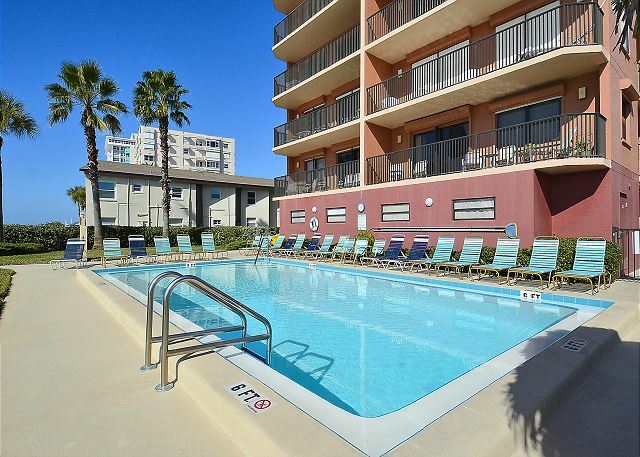 It is located in North Redington Beach not far from restaurants, shops and other activities. Famous John's Pass on Madeira Beach is just a short drive or a couple Trolley Stops away. This is a non-smoking property with the exception of 2 designated outside smoking areas. The condo was just as described and shown on photos. We loved the view and proximity to the ocean. 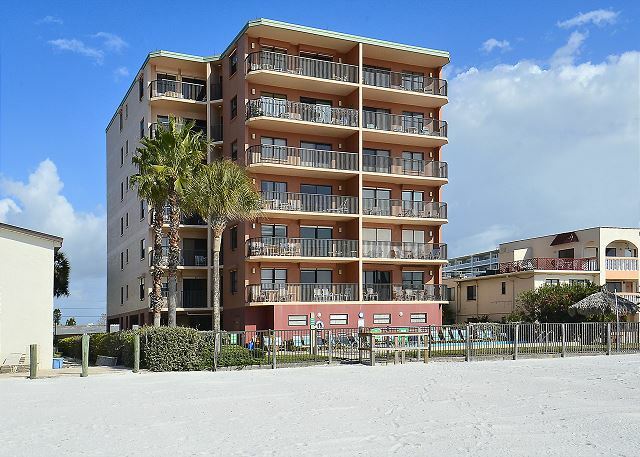 Redington Beach is a great central location. We particularly loved the spot because it was peaceful and relaxing. I’m a light sleeper and slept like a baby every night! We would definitely rent this property again. Beautifully decorated condo with stunning gulf views! We loved this condo! Loved the decor & the gulf view is amazing! Highly recommend it. Awesome!!! We are so glad you enjoyed your stay in this newly updated condo! :-) Come back for another visit soon!!! Wonderful rental experience. Very nice Condo. Extra blankets and pillows were nice. Beds were comfortable. Wine cork screw was broken so they gave us not just one replacement but 3. Great experience. We will be back. So great to hear, thank you!! Sorry about the corkscrew but thank you for letting us know, that will get you 2 extras!! Lol! :-) Thank you so much for being our guest and we look forward to seeing you back for a future visit. Great experience, property for peaceful relaxation. 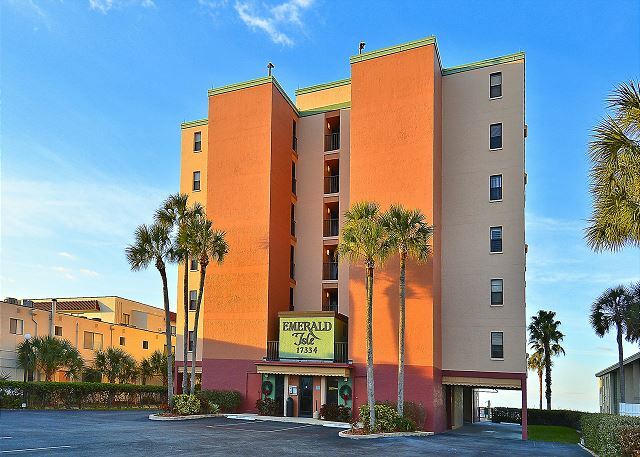 So glad to hear you had a great experience in this premier condo at Emerald Isle! Thank you for choosing to stay with us and we hope to have you back for another visit soon! Resort rentals were very helpful in finding us a nice condo that met our needs at the last minute. We are so glad we could help!! :-) Thank you for staying with us and we hope to have you back for future visits to our area. Usually, the place is well kept and a pleasure to stay but this time the pool area was a hot mess with broken umbrellas and chairs thrown in the corner, kids toys and floats everywhere (including halls), boogie boards and other beach stuff (like a paddle board) stashed by the fence into the pool area, sand everywhere in the shower area so it was impossible to clean off your feet and gates constantly left open so kids from Grand Shores were constantly in our pool for their games. The internet was constantly crashing and we had to keep flipping to other wifi sites which really hampered my husband's work. I left a detailed note on the form when I turned in my keys and do have pictures for you to show the owners. It was NOT the usual condition as to the other times we rented. We are so sorry if things were not kept up with on property during the time of your recent visit. We will be sure to pass this over to the condo association for their knowledge on this as they monitor the grounds. We were given feedback from other guests about kids propping the doors open and causing some disturbances and we did contact that condo in hopes to get things under control.....we are sorry if they did not take hold of that situation and apologize for any problems they caused. We do not have this kind of problem happen very often and we do feel it was an isolated occurrence to that week of visitors and again apologize for any disruptions that came with it. Please never hesitate to contact us at the office with any issues and we are more than happy to help how we can, we want everyone to enjoy their time while here. Thank you again for this feedback and we hope to see you back to this property that you enjoy!! This was our 2nd year at this condo and our experience was just as great as the first. Condo was remodeled with new master shower, tile in the bedrooms and extra dressor/make up mirror. This is the place for a quiet and relaxing family vacation. I can't say enough good things about it. So great to hear! Yes, the owners of this condo just did some recent updates to the unit and we are so glad you were happy with them!! :-) Thank you so much for choosing to stay with us and we look forward to having you back on North Redington Beach for another beach getaway soon! My husband and I have stayed in this area for years and have rented several condos. This condo was much larger than it looked in the photos, had a well stocked kitchen, and was very clean. There were several restaurants within walking distance and only a short ride to John's Pass. I would highly recommend this condo to friends and family. Awesome!! 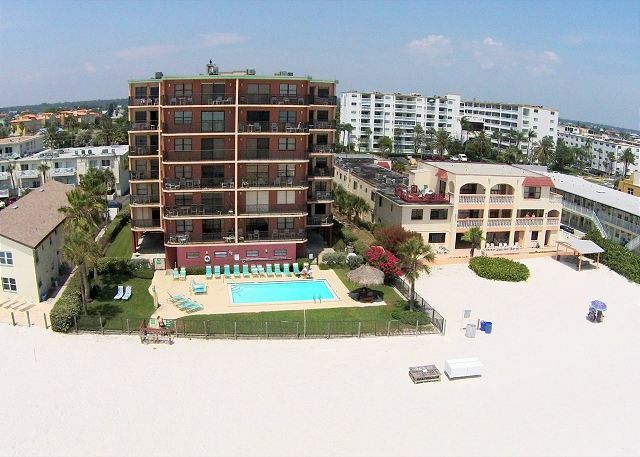 :-) We are so glad you enjoyed your stay in this premier condo at Emerald Isle on North Redington Beach! Thank you for choosing to stay with us and we hope to have you back for another visit soon! We liked it but would not rent this unit again because of no washer & dryer in unit. It needs more coffee mugs, also. Cleaning supplies, such as toilet bowl cleaner, should be available. Thank you for your feedback. Yes, the Emerald Isle property is one location that does not have the individual w/d in the unit, there are only the coin operated on the alternating floors. We have a large inventory and do have other locations that provide the w/d in unit, we would be more than happy to help you with any other options. In regards to the items listed here, please do not hesitate to contact us in our office for supplies that may be missing in the kitchen as we do keep a number of items here that we are more than happy to help with. Thank you for staying with us and we hope to have you back to our awesome area for another visit soon! Great stay at EI! First time in smaller unit-usually stay in 3 bdrm. Kitchen well equipped. Unit could use a broom to help with sand. Lobby back door lock was not working from the outside and pool gate locks were hit and miss with the keys. Overall we enjoy this property and the location! Hope to be back next year. Love that you had a great stay!! We apologize for the lock troubles you experienced and we contacted the condo association upon receiving this review, thank you for letting us know! Please do not hesitate to call us if there is anything on grounds that is giving you any troubles and we would be more than happy to have things looked at. Thanks for staying with us and we hope to see you back next year as well!! We loved this condo. You can't get any closer to the beach! Super clean, has everything you need from kitchen supplies to beach toys. Lots of great restaurants near by. Family friendly. Will definitively use this condo again! This is great to hear!! We are so glad you enjoyed this condo at the Emerald Isle; the interior, views and location are just awesome and we are so glad it fit your family!!! :-) Thank you for staying with us and we look forward to your next visit! Beautifully renovated, super spacious, perfect location. Awesome, we are so glad to hear you enjoyed this condos updates and the location overall!!! :-) Thank you for being our guest and we hope you will come back for another beach vacation with us soon! My sisters have stayed here before and loved it so i came for the first time with them for our family vacation. Location is great. Close to many things to do. Condo felt very homely. Clean and very modern. Will definitely return for future trips. This was our first time staying at this resort and it was great. This property is managerd by Resort Rentals and when i called in spoke with one of their associate and he was very professional, great customer service. The room was very spacious for the family of 4, the only thing i found is the master bedroom floor is all cracked. It looks like there was renovation through out the condo except that 1 bathroom. . Redington beach is a quite beach for familys with kids. Before we stayed at St Pete area and its definetely more live, there is more restaurants, coffee shops then the redington beach. You had to drive in order to get to a restaurant. However overall it was great stay at the emerald condo. Thanks so much for your post! We are glad you enjoyed your stay but we do apologize for any cracked tiles! Thank you for letting us know about this and we made sure to have our maintenance go over and take a look at things. Redington Beach is a bit less commercial than St Pete Beach it is true, but we are glad that you enjoyed the area and its location on this stretch of beach! :-) Thank you for staying with us and we hope to have you back again soon. Spent two weeks in mid-February 2017 in unit #401, Emerald Isle Resort. The weather was just perfect as was the condo unit. The kitchen and family room had just gone through a renovation that was very tastefully and professionally done. The reno only added to the enjoyment of the unit. The Resort Rentals staff was very friendly and professional from reservation to checkout. 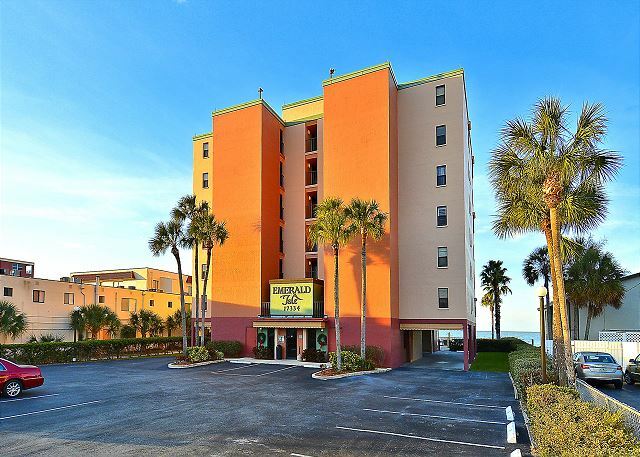 I would highly recommend Resort Rentals and unit #401 to anyone wishing to enjoy a relaxing, carefree trip to the North Reddington Beach area. This was our 5th stay at Emerald Isle. Our unit, #401, had recently been renovated and is the best unit we've rented there so far. It was very well equipped, particularly in the kitchen. Thank you for this post! We are so glad to hear you enjoyed the recent updates that were done to the unit, the owners did a lovely job!! :-) Thank you for being our guest and we look forward to your return visit! Our vacacion was really nice.The location was really nice also our room and the beach and the pool. Great location, nice unit with lots of room. Pool is small but never was overly crowded. 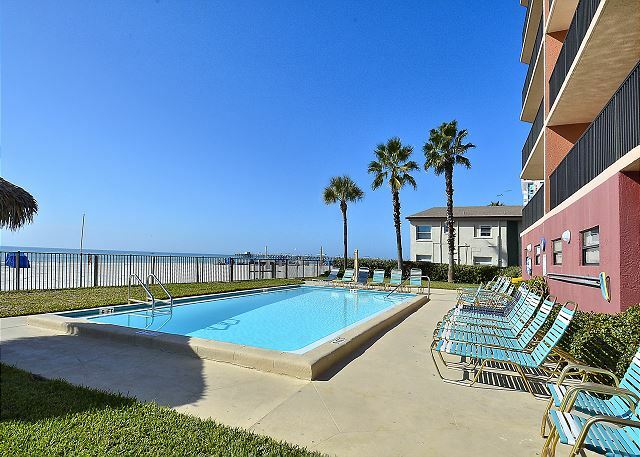 Beach and ocean is wonderful and just steps away from unit. Our daughter left a stuffed animal and it was shipped right away to us. Great customer service! Thanks so much for the post! We are so glad you enjoyed your stay here and we are so glad that Rufus made it home safely!! We wondered about him. ;) Come back and visit us again soon!! This condo was great! The condo was nice and bright. There was a beautiful view of the beach. The only downfall was the key issue, needing a key to unlock the gate to go to the pool and unlock another gate to go to the beach. Punching in a code would make things easier. You had to make sure you had the key with you at all times. Thank you for taking the time to make this post! We understand that multiple key entries can be frustrating, unfortunately that is something that is done through the association. We will pass along the comments to them for sure though, key pads would be great!! We stayed for one week in April 2016. We were so happy with our accommodations! The only thing that was an issue for us was the picking up and dropping off of keys to a property not located near by. We would definitely recommend this property to friends and wouldn't hesitate to stay here again! Great Location right on the beach. Clean, quiet and very nice pool area. The location is great, the view is fantastic. The condo is very clean and well appointed. Beds are comfortable. Rooms are spacious. Only drawback--the furniture in the living room is old and tired. Otherwise a fantastic place and we would definitely go back. Description was perfect. Location we thought was perfect. Heated pool, beach was great. I'd go back. Would have liked a queen bed in second bedroom. We enjoyed our stay at Emerald Isle. The staff of Resort Rentals were professional and pleasant. We enjoyed watching New Years' Eve fireworks from the balcony. Loved the direct view to the beach and the community where the condo is located is very nice. We had a great time at Emerald Isle and are hoping to go back next year! The property was well maintained, clean, and had all the essentials one needs for a week of vacation. Beds were very comfortable, and plenty of towels were provided for our family of four. My only recommendation for improvement would be to regularly clean the balcony furniture - we had to wipe them down to remove the dust and salt residue. Other than that, I highly recommend Emerald Isle! location is very good, nice view of gulf. Old kitchen but clean, condition of condo is fair. The pool was closed for one day , elevator was not working for short period of time. Manager was polite and solved the problem. Parking is an issue, since some quests parked not in their spots. Parking should be more enhance. Thank you for your review. I appreciate you taking the time to let us know what you liked about the condo as well as suggestions on areas that you feel could be improved or enhanced. Thanks again and we hope to see you next year. Would retun to this unit! Very spacious and well equipped. Beautiful beach and setting. Quiet and private, comfortable. We had a great experience, loved eating breakfast looking out over the ocean. Kids (3&5) never wanted to leave! 2 bedroom units on the sides with decent beach view, 3 bed room units in the middle with spectacular beach view. 3 bed room units much bigger than 2 bedroom units. Great pool. Great beach location. Adequate parking, walking distance to several restaurants and local rental places for bikes, etc. Key required to enter building, pool and beach area. Drop off and pick up of keys located about 6-7 miles south of Emerald Isle condos. 2 bed room units sleep 4, 3 bedroom units sleep 6. Management was firm on # of people in the rooms. The sofas are not fold out beds. Greatly enjoyed our stay. Loved the condo and the area. Clean and the location of the building was in an ideal spot for relaxation and close to everything. We loved it. The condo was perfect.the view from the balcony was great! So many great little towns to check out!The pool and beach were super & the other guest s ,that we met were pleasant.We had absolutely no complaints. We would definitely stay there again. Glad you enjoyed your stay...and thanks for letting us know about the chair. We cleaned it! Every thing was great, was my first time visiting the S. Pete area. Wish I could have stayed longer. Property was very clean, nice pool that was also very clean. Would definitely stay at this property again! 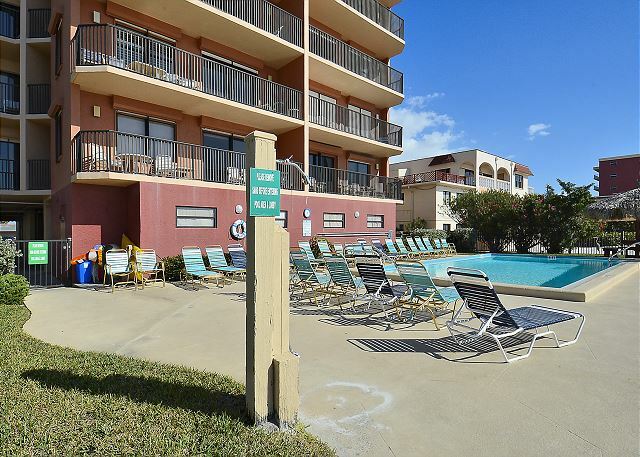 The keys required to access the building, pool area, and beach were very cumbersome to hang onto and use. I had to carry all four keys and use all four twice with each trip: once to enter and again to exit. Had a nice relaxing vacation at Redington beach. It was inconvenient having to drive out of the way to pickup & drop off keys and was also a little aggravating having to use a key all of the time. The property was peaceful and clean, not too crowded. Enjoyed it & didn't want to leave. We had a great time! The place was clean and the kitchen was well stocked, everything worked. Excellent location, the back yard was the Gulf! Beautiful views from the kitchen, living room and deck. We will come back again. A Great Week-We Will Be Back! We had a wonderful time at Emerald Isle. Location is perfect, especially if you aren't looking to be in a crowded/tourist area. There are many shopping opportunities within close driving distance. The pool area, building and grounds are in great condition. We were there with our 2 daughters, age 13 and 6, and they had a great time. Beach is amazing! Only complaint I would have would be the carpet in the unit, especially the living area. It definitely needs replacing, tile would be a good option. I loved our room very clean. Pool was clean. The only thinn I didn't like was always needing your key for every thing . Beautiful View, spotless condition, WELL STOCKED kitchen, safe & convenient location. Keys can be a hassle sometimes but it keeps the unit and occupants safe I guess. Check out staff was not the friendliest but tolerable. We would come back in the future for sure. There was a note from the cleaning ladies that we found after we were there. We did give it to when we left. The garbage disposable stop working the second week. The rental staff was very helpful and informative. The unit had a great location and was very clean. Parking was adequate, and the pool looked inviting. We had a great time. Thanks so much for the high ratings. I am sorry the mattress was uncomfortable for you. I have found out that the master bedroom mattress was just purchased in 2009 and the guest bedroom mattresses in 2010. Unfortunately it’s very hard to find bedding that works for everyone. I am glad to hear that you plan to vacation with us again. Hope to see you real soon! *****UPDATE***** A brand new faucet for the kitchen was installed! Very people at the beacdk. Very nice outside. It was an awesome stay. We had 2 other families also stay at Emerald Isle for our Spring break. The adults and teens had a fun stay. The location, condo and beach we perfect! A great experience once again. The complex is wonderful and the condo was excellent. Clean, great view, very very well stocked kitchen. Thanks for a great holiday. Have stayed in various units at this property for 8 years and recommend it highly. Very pleasant and relaxing ... a real oasis! We thoroughly enjoyed our stay at Emerald Isle. We plan on returning to the same place in the near future. My family and I had a wonderful time staying at this condo. It was very clean and in a great location along the Gulf Shore. The southern view was immaculate and being right on the beach was a huge plus for us. I really liked the size of the building (only 6 floors- 4 units per) as opposed to some of the giant hotel/condo options available. The private balcony was a nice place to start and end each day. Building was very secure with locked lobby & pool area. Kitchen was well stocked with more items than we were expecting (enough to have our Thanksgiving dinner!) 3 flat panel tv's were a nice touch. I would highly recommend this unit/building. definitely would reccomend to friends. with flat screen TV's. Resort Rentals provided a good service and at a good price, however they did not include any maid service and was unaware of this at the time of booking. Not a major problem though as laundry facilities and plenty of linen is provided. I would recommend them and this area. We enjoyed our stay very much. It was a beautiful location, and we loved the view from the balcony. It was quiet and restful. The only inconvenience was parking. We had two vehicles and had to park the second vehicle on the street since there are only two guest parking places for the entire condo. Very nice location on the beach; pool spotless. Lots of light in the condo. Very nice view of the beach from the balcony. Only comment: we found everything we needed in the kitchen but equipment (pots,pans,knifes)should be updated. We noticed a total lack of recycling facilities and this should be looked at. Staff has been very helpful answering all questions before our arrival. Great location. No water pressure in master bathroom shower. I fixed the long time stuck garbage disposal. Everything was fine except for one evening after dinner, the AC quit working. It was after hours, so we had to spend the night without air. Miserable night of sleep. Turned out to be the circuit breaker, which, and resetting, continued to break a few times, but finally stayed on. We were very pleased with the vacation rental. The condo was clean, spacious enough for 4 people. I would recommend a sleeper sofa for the living room. We love having the beach right outside our door. Great food choices to eat within walking distance. Everything was perfect. The only change I would suggest is a new mattress in the master bedroom, it wasn't very comfortable. We had a wonderful stay and will definately be returning. The condo is also in a great location, close to everything. A very enjoyable holiday!! The three condos we rented were without a doubt the nicest, most well equipped of any we have stayed in over the last 20 years.